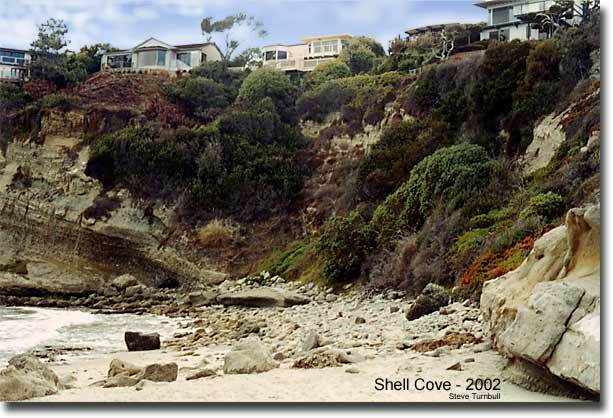 Pictures of Shell Cove in Three Arch Bay from 2002. Located in South Laguna Beach California. A very beautiful beach at the northern end of Three Arch Bay, Shell Cove is sheltered by Whale Island on the south and rugged cliffs to the north. 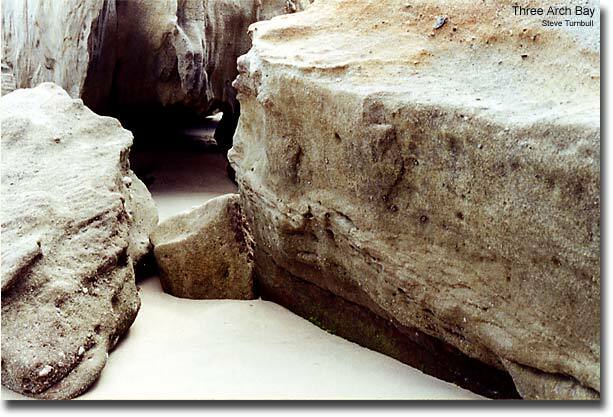 This is a photograph taken during the winter, when the strong Pacific storms remove most of the sand from the beach, leaving a very rocky shoreline behind. During the summer, the sand returns to create a smooth and warm beach. A great many sea shells wash up and stay in this cove because it is protected from the southward littoral drift of the Pacific, while most other beaches are exposed, allowing the shells to be swept away. 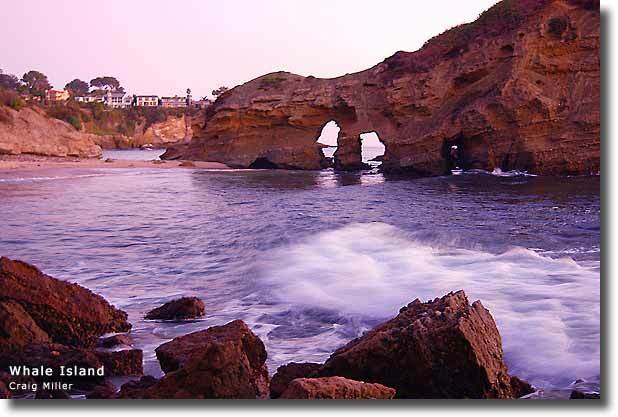 Shell Cove is the picturesque setting for many films and photo shoots. "Captain Blood", starring Errol Flynn, Olivia DeHaviland, and Basil Rathbone was filmed here in 1935, and "Give Us This Night" starring Gladys Swarthout filmed in 1936. Whale Island , across the water of Shell Cove. Another fine photo by Craig Miller. Like a zen garden, but created by the greatest Master.